Last week I finally did something that I've been planning to do for nine years! I went to see the Millenium in a Box collection which was put together in 2000, at the turn of the millenium (obviously) by the Canadian Bookbinders and Book Artist's Guild (www.cbbag.ca). This is a collection of work by 35 Canadian book artists. "Each artist produced a conceptual interpretation of where the new millennium may lead, whether technically, societally, in terms of personal development, where the book arts may go, or in any other way that challenges them." There are 50 of these boxes; they are held in various locations across Canada, and there are a few outside Canada, and some that are available to be borrowed. Each participating artist created their work in an edition of 50, so there is one of each in each box. One of the boxes is permanently housed in the Special Collections library at Dalhousie University here in Halifax, which is where I did my MLIS degree and where I first started bookbinding and I even worked in this library for a while... but somehow I never managed to find time to check out the Millenium in a Box collection until last week. The catalyst for this event is a separate story, but here's the quick version. I made some new friends recently, a couple who were traveling to Nova Scotia from their home in Ann Arbor, Michigan. They are both artists, one of them doing book arts (among other things) and the other a painter and retired art professor. So I asked if they would like to come with me to see this collection as it would be much more fun to view it in the company of others with similar interests. It was a lovely way to spend our time and I'm so glad we were able to get together (thank you G & B!). Since the Millenium in a Box collection was not on display last week, they pulled it out of the closed stacks and we were able to sit down with the box and all its contents and look at each piece very closely, read the descriptions, etc at our leisure. 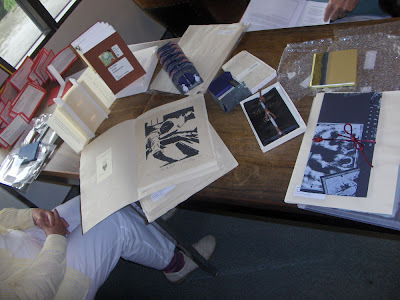 There is a full range of book and paper arts included in the box: artist's book, paper making, calligrapy, printmaking, etc. If you are interested in seeing it, check the CBBAG website where it lists all the public locations of the box. As I mentioned above, each piece was made to show the artist's ideas about the upcoming millennium. Looking at this collection nine years after its creation means that there was an additional element of commentary as we worked our way through the objects. It is a fascinating comment on society of the year 2000; seeing the issues, ideas, and common themes that recur among the various objects and how a mere nine years can affect their meaning. I must remember to go back and look at it again...after another decade or two passes. I saw this exhibition when it toured Australia, I guess in 2000. I thought it was interesting at the time but I'm sure it would be even more interesting now 9 years later, as you said, to see what people were thinking then. Cool, I didn't realize it had toured Australia. So great that you were able to see it!